With all the convenient sizes and shapes they come in, Tupperware and other plastic containers have become very commonplace in the kitchen. However, all those different sizes and lids can make storage a nightmare. 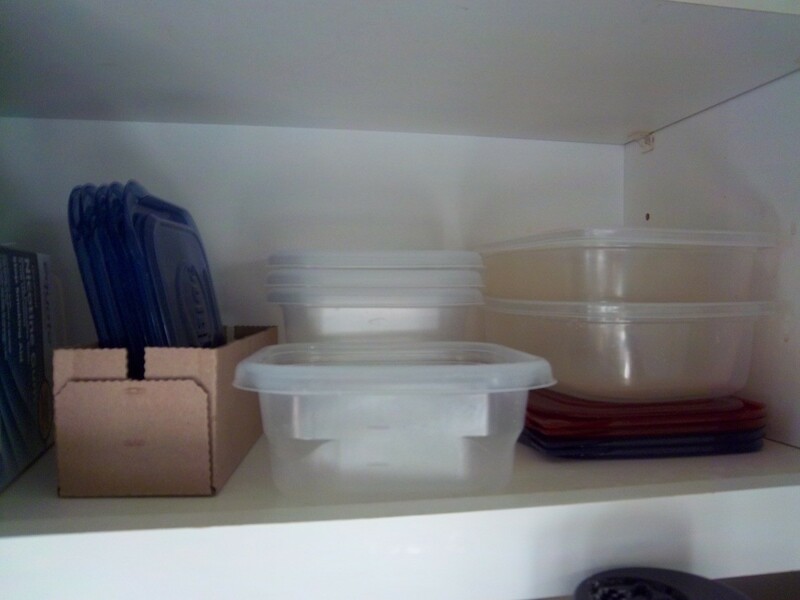 This is a guide about organizing Tupperware and plastic containers. Once, when I was younger I was having a small dinner for a few friends and didn't have time to wash all of my storage containers, so I stuffed them into the oven out of sight. The dinner was a success and everyone was happy with the spaghetti and salad. A week or two later I wanted to bake a casserole and turned on the oven and set it to 350 degrees F. Well, as a little time went on I smelled something strange and saw a little smoke coming from the oven. Well, you can guess what happened. Luckily, I worked for a pizza place and had a large pizza pan underneath all of the plastic. To this day, forty years later I have this really colorful plastic platter to remind me to check the oven first. Tips for organizing plastic storageware (i.e. Tupperware, Rubbermaid) from out ThriftyFun community. We have a dishpan that we keep all of our lids in. We haven't really figured out a way to organize all the bowls/containers themselves, but it does help keep the lids well organized. We store them sitting up on the lid edge, so that we have them in rows sitting in the dishpan, which we keep in a cupboard. I stack all my Tupperware together, then all the Rubbermaid, and other brands, i.e. Zip-Loc and Glad Loc. I keep lids for each specific brand in its own basket. This really helps when looking for a lid. You don't have to dig through all of them to find the right one, just the ones of that specific brand. Put all the same shaped items together. Put round containers all nested together, without lids, square containers all nested together, large ones with smaller ones inside and so on and so on. Do the same with the lids. It will be easy to find the lid for the container if all the square lids are sorted and lined up together, small to large. They will nest a bit too, saving room. 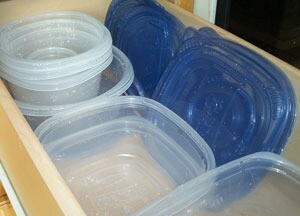 All Tupperware and similar items should not be stored with lids on, it takes too much room and may trap odors. I have huge pot for lobsters under one of my cabinets. I throw all my tupperware in there with the lids on and it works for us. Tupperware also sells lid holders that are great for holding tupperware lids and you can stack the containers in each other. One way to keep your lids in one place is to use a cereal box or anything similar. Measure 5-6 inches from the bottom, now cut on a diagonal to the top corner, do same on other side so both sides match. Now place lids in by letter, tupperware uses a lettering system. If you look under the bowl, there is a letter (ie: cereal bowl is a "C" bowl, so there is a "C" on the tab) lid fits on it. etc. You could decorate the boxes to match the kitchen, I use them to keep my crafts magazines in order, soft covered cookbooks, and I used leftover wallpaper to cover the boxes. Several people I know have designed their kitchen cabinets to include large deep drawers for their Tupperware. Although I hope to someday do this as well, until then, I am considering using a Rubbermaid and storing it at the bottom of my pantry. Have you ever thought that if you have a cupboard full to bursting with plastic containers, you may have too many? I would think the first thing would be to consider your needs. What do you use these containers for and how many do you have in use at any one time? If you use them for leftovers, lunches and dry goods storage, most of these containers should be in continuous use, therefore not cluttering up a cupboard most of the time. If you only use some of them intermittently (e.g. in autumn for freezing produce), do they need to be stored in a kitchen cupboard? Box and label "autumn freezing containers" or whatever and store somewhere else. Are there any containers you never use - get rid of them. 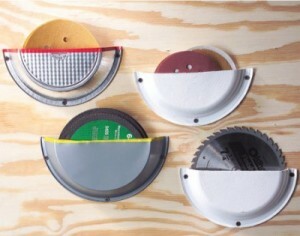 Are there any stained ones, one's with missing lids or bottoms, warped ones - get rid of them. When you have weeded out the extras store lids, graduated from small to large, in lidded plastic container(s) and bottoms 'nesting' in each other in another plastic container(s). This keeps them dustfree and makes wiping out the cupboard shelves much easier - you don't have to remove every container individually. When you need a container you can take out the whole boxful and search for it at work top height - saves poking around in the back of the cupboard. I keep the round containers on one side of the cupboard, and the square/irregular-shaped containers on the other side, smallest in front, most frequently used on the shelf that's best within easy reach. For each side, in a large ziplock bag for each shape, I store the lids, round in one baggie, square in the other. The lids that won't fit, along with the baggies themselves, are stacked between the round and square areas/middle of my cupboard. It helps to put the container away in the same area after unloading the dishwasher, instead of cramming them in the cupboard to "sort out later." Also I try to store the containers upside down, which looks funny in the cupboard, but it's in case any dust settles or the dishes aren't quite dry, etc. It all drains off the containers or doesn't affect the inside of the containers where the food actually goes. I keep the lids with the containers. This is just one shelf, the others are similar. Although it's not Tupperware, this system should work with any group of containers. Use a large square basin to put plastic storage container lids into in your kitchen. You can then stack your containers inside each other. When you need a lid, you go right to your bin and find what you need. I have a file cabinet in my pantry. I got it from a pal for planning her yard sale and I use it to store my Tupperware lids. No more lids falling out of my kitchen cabinets when opening the doors or unsightly, unorderly cabinets for someone to look in while visiting. I have many glass lids. In order to save room, I cut a dish drainer in half, just big enough to fit in my cupboard and line my glass lids up in the slots. This way I can stack my glass bowls and save lots of room. I also have extra lids to cover all sizes of plates with. Some of the newer plastic containers we can buy now have the lid snap on the bottom. A good idea, but boy are they expensive. How do all you gals keep track of the lids. It's always something isn't it. I stack the containers (all the same type together) and stack the rectangular lids vertically, secured between the rectangular containers and the cabinet wall. For the small, circular lids, I stack them together and store them in an old, thin icemaker box that fits just right in the cabinet next to all the containers. The larger boxes are stored similarly in a lower cabinet. Picture: There aren't many boxes in the cabinet since I made and stored soup today. As you see, the lid box is labeled - for my husband! I store mine in the pantry where cans of food is stored with lids on each one. They stack very easy, good luck. I store my lids in a separate containter next to the stacked "bottoms". This way everything is together. I don't ever store the lids ON the container because sometimes it takes longer for the little ridges & places like that to dry on the contairner or the lid. By storing them separately, they have a chance to air dry before use. Also, about once every other month or so, I go through and make sure I have a lid for every bottom and a bottom for every lid. Any leftovers get trashed. The majority of my containers are butter tubs, yogurt tubs, cream cheese and sour cream tubs. These are the ones I use for leftovers in the fridge. But I do have others that I have bought for specific reasons. I have some nice square ones with tight fitting lids. I use those for freezing soups, chili in the winter. After the winter season and the soups and chili have all been eaten, I wash them up and store them in a separate part of the kitchen till the next winter. And finally I have a lot of the Lock & Lock storage containers. Those are used every day to store things in on hte counter. In these I keep flour, sugar, tea bags, coffee bags, noodles bread crumbs, cereals, marshmallows, coffee creamer, stuffing mix, brown sugar, rice, mashed potato mix, hot cereal mixes, hot drink mixes, chips, instant soup mixes, all sorts of things. I also use them to store dog and cat treats. And I found one that will hold a full bag of cat food. Still looking for one for the dog food. I use a plastic bin with the basket weave side's to stack my lid's. I put the smallest in front and they graduate to the largest in the back. This way I can see them and find the lid I need quickly. My son puts the dishes away for me, but we solved this "tupperware" problem by him leaving it on the counter, and I do it. Less fuss in the long run. I stack/nest my assorted pieces on a shelf and put the lids in a box alongside. It is the stacking that my son can't handle, and often the plastic stuff is wet, so it dries off on the counter, and then I deal with it. I have a huge bowl that I keep all my lids in. I keep the bowl in my oven. It's close, but out-of-the-way. Whenever I need to use my oven, I just take the bowl out. Everything's together and easy to find. When it comes time to wash and put away the dishes, I chase him out, lol! If I wash and put away things myself, at least I can find them again. I use two bins to keep lids. One for circle lids the other for square lids. I keep these bins on an open shelf. It seems to work for me as I have LOTS of tupperware. I went to the dollar store and bought 2 baskets. One for larger containers and 1 for small containers. I store the containers and lids in the same storage bin. I stack the containers and place the lids standing up beside the appopriate containers. I use ziploc containers and lock and lock containers so this system is very useful for me as I have many. Any too large to fit in basket I stack by size beside the baskets and the lids go on the other side of the basket between the cabinet wall and basket standing up. This saves alot of room and alot of seaching time. My kitchen door goes out into our garage. Right at the door, I've placed 2 - 2 drawer filing cabinets. One cabinet has lids, round and square and the other cabinet has round containers and square containers. Very handy and everything in it's place. I'm having a tough time trying to control storage containers that I use for food. Now I have to have three bags and boxes to put them in and this has to cease. Anyone have suggestions? This is in my small kitchen and has given me frustration each time I have to look at this mess. I have a very small kitchen about 5x6. I have absolutely no place to put my plastic lids. I don't have room for a file cabinet; I barely have room to walk around. Please help me with any suggestions you might have. 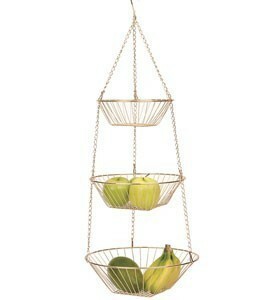 You can find tiered hanging fruit basket for cheap at most places and it can be hung out of the way, maybe in a corner. You could line the tiers with fabric scraps or ribbons or artificial flowers etc if you dont like the look of the just the lids in the basket. I used to use one in my bathroom for towels and sundries. I found this cool idea! The pic tells the story! I like those cute little napkin holders you can buy or you can cover a cereal box with pretty paper, or contact paper and cut it in half and then use that, or you could get a cute basket at the thrift shop. It kind of depends on how many you have. Another solution is bagging them. And hanging up the bag inside a cabinet door or ?. Not really easy to access, but it can work. I use a basket to keep all tops in. You can leave on the counter put it in a cabinet or even hang from the bottom of your cabinet if it has a handle. Here's an idea that might work: Get some of the tacky rubber stuff for hanging things up (one brand name is FunTack) and put a small ball on each lid & stick it to the inside of a cabinet door. When you use the lid, leave the ball of tacky rubber on the door for when you store the lid again. I have all kinds of things stuck on the backs of my cabinet doors with either FunTack or magnets - such as small juice powder packets, sweetener packets, charts of substitutions, a chart of pan sizes and how much they hold, directions for cooking rice and pastas, etc. This keeps everything handy & easy to find. I also use some in the bathroom on the back of the medicine cabinet door (for the kind that swings out, not sliders) and linen cupboard, for sample packets of pills, shampoo, a first aid chart, etc. I have too many plastic containers and a very small cupboard. Every time I organize it, it still ends up in a mess. I need advice on what to do. I've got the same problem. I always stack them inside each other. Make a few different stacks, largest on the bottom. Put a box in beside them and stack the lids together on their ends. If you still have a space problem, try separating the containers you use the most, keep those in your kitchen cupboard, and store the rest in another storage location. 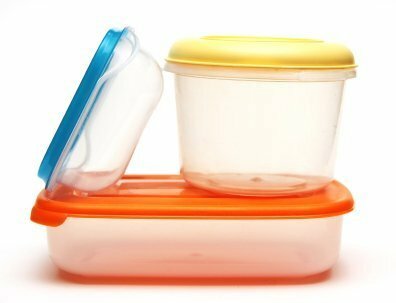 I would like suggestions for storing Tupperware. I keep one cabinet for small to medium size bowls stacked as neat as possible, another for big bowls. Then I have a deep sliding basket in my rolling island and all my lids go in there. Might not be neat as bowls, but they are all there together and easily accessible. Does anyone have a good way to store and retrieve these little necessary evils? I'd like to reuse yogurt, butter, and other plastic containers with lids, but inevitably lids become separated from containers, and the storage shelf is a disaster. I just can't justify keeping these items if I can't figure out a good way to organize them. Thanks!